Before the old Fred Ho died on August 4, 2006 of advanced colo-rectal cancer, he had created an amazing body of radical, “popular avant garde” operas and music/theater works, which he interchangeably called “manga music/theater or opera” or “martial arts opera” or “living comic books.” Innova is proud and honored to release the first-ever “jazz” and “new music” manga-CD project of two of these works joined as one. DEADLY SHE-WOLF ASSASSIN AT ARMAGEDDON! was the last completed full-stage production of a Fred Ho manga-opera, written by Ho and Ruth Margraff in homage to the 1970s “yellow exploitation” manga-movie series, Lone Wolf and Cub. This soundtrack recording to the show features Ho’s foray into the use of the 20-string bass koto (performed by Yumi Kurosawa) and Japanese shakuhachi and fue flutes (by Masaru Koga). This fully illustrated play-story features illustrations by East Village icon, Mac McGill. 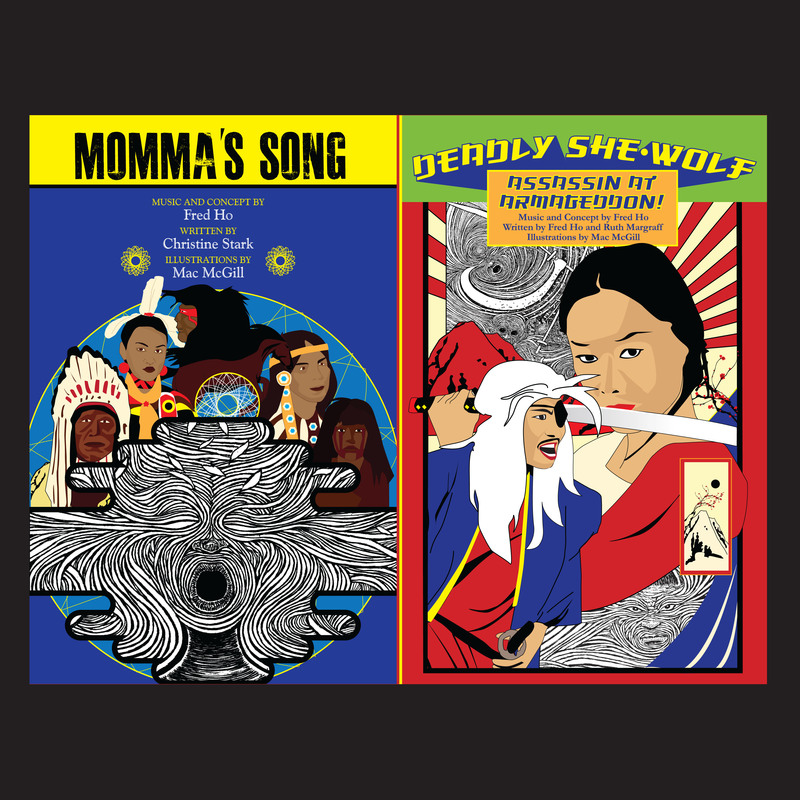 MOMMA’S SONG is a dark-as-night epic cosmo/choreo-poem written by native American poet Christine Stark of a horrific and brutal tale of genocide, ecocide and matricide visited upon Turtle Island, and created as a tribute to Archie Shepp, whose classic signature work of the Black Arts Movement, Blasé, had a profound impact upon the old Fred Ho. This recording is dedicated to Mr. Shepp. Illustrations by Mac McGill convey Fred Ho’s musical manga imagination. FRED HO THE COMPOSER uniquely and incredibly traverses across genres with both ease and innovation, his compositions having been commissioned by and featured at some of the most prestigious artistic institutions of the U.S., including the American Composers Orchestra (When the Real Dragons Fly! at Carnegie Hall), the Chamber Music Society of Lincoln Center (for Josephine Baker’s Angels from the Rainbow for the Imani Winds), the Guggenheim Museum and the Brooklyn Academy of Music Next Wave Festival (for Journey Beyond the West: The New Adventures of Monkey and Voice of the Dragon: Once Upon a Time in Chinese America…), and most recently, Fanfare to Stop the Creeping Meatball! by the Boston Symphony Orchestra for the 2011 Tanglewood Music Festival. His works personify the cross-cultural hybridity of American New Music and Jazz. His six-octave range and fluency with extended and esoteric techniques on the baritone saxophone equals his prodigious abilities as a composer and creator of operas and other large-scale, epic works (including genres he has originated such as “Manga Music/Theater” and “Martial Arts Ballets” and “Living Comic Book Performance”). Ho’s distinguished awards include two National Endowment for the Arts fellowships (in Jazz Composition and Opera/Musical-Theater), three New York Foundation for the Arts Music Composition fellowships, six Rockefeller Foundation awards, the Duke Ellington Distinguished Artist Lifetime Achievement Award, the Harvard Arts Medal, and the American Music Center’s Letter of Distinction. FRED HO THE BARITONE SAXOPHONIST in this recording demonstrates his virtuosity with a six-octave range on the low-A baritone saxophone and an indelible and unique sound and approach to that horn that establishes him as one of its greatest innovators and performers. "[V]ery overtly and progressively jazzy, with moments of beautiful piano chords and bluesy plaintive vocal musings from the protagonist interspersed with some really wild improvisatory sax and drum duels … [T]he packaging is visually attractive but quite atypical; almost avant-garde. "[O]ne has to admire the creative energy and determination that Fred Ho must possess … whether it is Mozart, the Beatles or Fred Ho, music is always a beneficial enterprise."